Taken at a neighbor's garden. 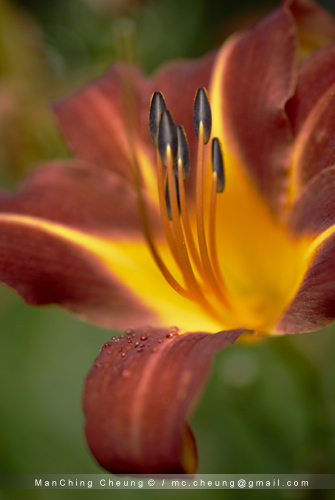 I have one taken with a closed down aperture, but I prefer the shallower depth of field to better set off the stamen and pistil. A list of the top 7 scientific articles, in genetics for the last month, as ranked by the Faculty of 1000. There’s also an interesting article in this week’s Nature about efforts to find and archive old data. Part of is for historical interest, but in a field like climatology, it is can be vital to keep the primary data for local weather over a “small” 100 year time frame. We should pay attention because Penrose has repeatedly been far ahead of his time. The most influential person to develop the general theory of relativity since Einstein, Penrose established the generalized behaviour of space-time geometry, pushing that theory beyond special cases. Our current understanding of black holes, singularities and gravitational radiation is built with his tools. In the same issue of Nature, Jascha Hoffman reviews Charles Seife’s Proofiness, where Seife creates a “taxonomy of statistical malfeasance”. A second interesting paper, this one published in Science. Workers were able to identify a specific neural circuit, in zebrafish, that processes visual information. Specifically, this circuit is tuned to small objects, perhaps used in the capture of the zebrafish’s prey.